One of mine saw me making it, and the other did not, but heard some whispering from his brother about the “secret” ingredient. Of course it was the one who wouldn’t eat spinach even if you paid him millions of dollars, gave him cookies or toys or any of the other things he wants on a daily basis. He got so upset at not being in on the secret, that I was forced to tell him. As you’d expect, he had a look of fear and revulsion on his face and let me know he was NOT going to eat that. When it was done, I put it in front of him and he said no way, just as horrified as before. His brother, being more adventurous, tried it, said it was good and kept eating. Still there was no way he'd try it. I told him to close his eyes and he only had to take one bite. If he hated it, I'd make him something else. Guess what? He actually liked it. He ate one piece and all the fruit on the side. Being a grazer, he came back later and specifically asked for the second half. This is big for him, sometimes it’s hard to even get him to eat vegetables he somewhat likes. As bright green as it is, instead of being filled with chemicals and artificial colors such as Fd&C Yellow 5, Fd&C Blue 1, (artificial dyes have been shown to cause behavioral problems in children) and propylparaben as a preservative. Spinach is a good source of fiber and antioxidants as well as iron, vitamin A, vitamin K, folate, vitamin B2, vitamin B6 and manganese. Plus, using spinach adds vegetables they probably wouldn’t have gotten otherwise especially at breakfast. Adding a fat such as butter or coconut oil to the pan helps absorb fat soluble Vitamin A and Vitamin K and adding some vitamin C, from fruit helps with iron absorption. In this version I decided to make a frittata for two, but you can use this recipe to make scrambled eggs or a green omelet as well. Double the ingredients and it will serve four. Be creative and add your own favorite ingredients. Leave out the ham for a meatless version, green eggs are just as fun, since the ham isn’t colored anyway. Wash and dry the spinach. 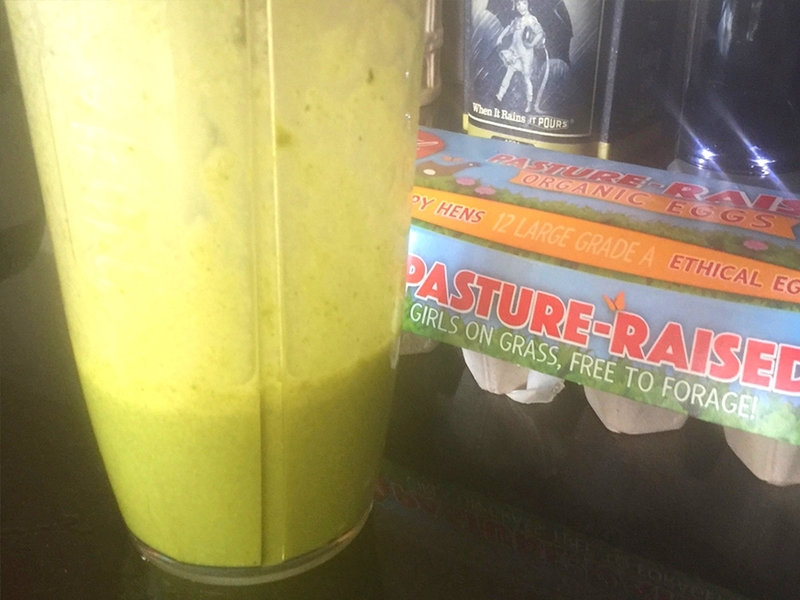 Add eggs and spinach to a blender and blend until smooth and green spinach pieces disappear. Preheat your pan (we use cast iron, so it can go right into the oven) and spread butter or coconut oil around the bottom and sides. Add egg/spinach mixture, and then add ham, evenly dispersing. Sprinkle cheese over the top. Cook for 2-4 minutes covered on low until edges are set, then put in oven to finish for 5-8 minutes or until cooked through. Serves 2. Double the eggs, spinach, etc. and use a larger pan to serve four.